Melilla is a small town bordering Morocco on the northern tip of Africa. Christians, Muslims, Jews and Hindus live together in this Spanish enclave which is no bigger than 12 square kilometres. A film festival focusing on Spanish films takes place during the Easter celebrations. 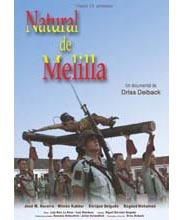 During this festival, which many Melilleans resent, a variety of people talk about films, politics, religion and homosexuality. Among these people there is a member of the Jewish community who thinks there will never be enough movies about the Holocaust. There is a Muslim who believes that Melilla is Arabic and should belong to Morocco and a Catholic barber who thinks that there should be more fascist monuments in Melilla than there are. There is also an eighteen-year-old Muslim transvestite who is proud to be an atheist, not to mention a Jew who has converted to Catholicism, or the three old gays who are all agreed that the excitement of tasting forbidden fruit was lost with the arrival of democracy and freedom of choice. And there are many others. Formato: VHS. Color. Normal 1:1,37.